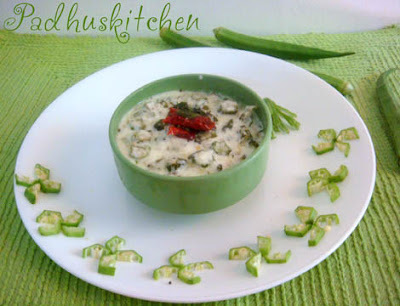 Today I am going to share with you a very simple lady's finger raita. I prepare it in two ways - one is my mother's style and the other one is Kerala style Vendakka Kichadi (Onam sadya special) which I learn't from my friend. There is not much difference between the two, except the addition of coconut. I love all types of raitas for the simple reason that they are very healthy and can be prepared in a jiffy. Vendakkai pachadi is prepared by frying the ladies finger till crisp and then it is mixed with beaten curd. Today let us learn how to make vendakka curd/Thayir pachadi by following this easy Vendakka pachadi recipe. 1.Select tender ladies finger.Wash and wipe it dry with a clean towel. Cut off the crown and the tip. 2.Cut it into thin slices. This is very important. 3.Shallow fry the ladies finger along with green chilli in oil till brown and crisp. 4.After it cools, add curd and needed salt. Mix well. 5.Heat a tsp of oil, add mustard seeds, when it splutters, add curry leaves and red chilli. Add this seasoning to the pachadi. Serve as a side dish along with rice. Variation - You can add chilli powder instead of green chilli if preferred. The first 3 steps are the same as above. Grind 3 tbsp of grated coconut, 1/2 tsp cumin seeds and 1 green chilli to a fine paste. Heat a tsp of oil, add mustard seeds, when it splutters, add curry leaves, red chilli and the ground paste. Saute for a few minutes till the raw smell goes.Then switch off the flame. Add the fried ladies finger and leave it to cool.Then add yogurt/curd, needed salt and mix well. Serve as a side dish along for rice. Tasty thayir pachadi looks yummy and delicious. Okra is one of my fav and okra pachadi is even better. Too good..
Padhu, Kerala vendaka kichadi has difference from okra raita. We usually grind coocnut, green chilies, and mustards seeds in addition to seasoning with mustards seeds. Raita is so refreshing ,thanks for sharing the ultimate comfort raita. I too prepare the same way,for the second version I add a bit of ginger too, it adds to the taste. Nice click as always. My fav raita!!!! Looks yummy!!! Simple easy yet different recipe.. Whenever I try making okra fry, I could see the jelly like fluid comes out and totally spoils the dish. My mother gave me the following tips: 1. Avoid stirring frequently. 2. Don close with lid where the evaporated water will fall into the pan and will make okra much fluidity. 3. Keep the flame in medium low. I followed all her tips but could not succeed with frying okra.. Kindly help me out..
1. After washing the ladiesfinger, wipe it dry with a kitchen towel. 2.For the first few minutes, I cook uncovered, then I cook covered. 3. Add a tsp of gram flour or thick curd if it is sticky. 5. Buy fresh tender ones which is less slimy. 6. Do not cut very finely.